I love macaroni & cheese. There is something about gooey, creamy cheese over lots of carb-y pasta that makes my mouth water. I’ve been looking for a blog-worthy macaroni and cheese recipes for a while now, but I had yet to test one that really made my taste buds jump for joy…until now. You’ve probably noticed that I often use 2% reduced fat cheeses in my recipes, but when it comes to mac & cheese it’s worth it to me to go all out and use the real thing. I’ve been working on a separate recipe for Wisconsin Cheese (coming in October!) and I bought a block of Black Diamond Vintage Reserved Aged Five Years Cheddar for it and used the leftovers in this dish. It is amazing. The more a cheddar is aged, the sharper and more flavorful it becomes. Using a cheese like this is perfect because it packs so much flavor that you can get a lot from a little. I often hear people say that they want to use a point-friendly pasta but they just can’t get into the flavor and texture of wheat pasta (not me, I truly love all pasta). On behalf of all those people, I was really excited when Barilla asked me to try their new Piccolini “Rich in Fiber” white pastas. They sent me two boxes to try, their Mini Rotini (which is what I used here) and their Mini Penne. Both have the same WW P+ values per serving as wheat pasta, but they look, feel and taste just like traditional white pasta because they have three times the fiber as said white pasta. White pasta lovers: keep your eyes peeled because I have a Barilla Piccolini giveaway coming your way very soon! 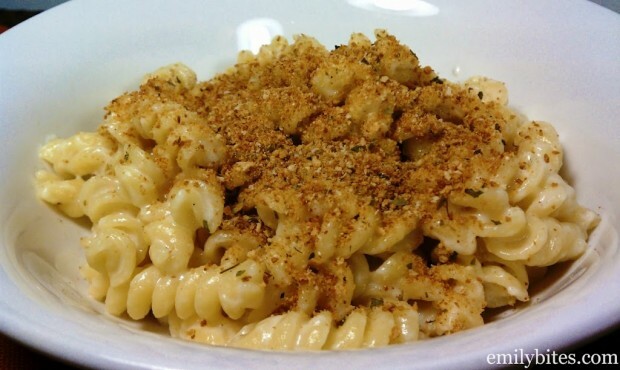 This Creamy Stove Top Macaroni & Cheese recipe was creamy, filling, flavorful and incredibly satisfying. It was just as easy to make as the kind you buy in the box and infinitely tastier. Now that is comfort food! Place the dry pasta in a colander and run it under water quickly to rinse. Let drain. In a medium saucepan, combine the uncooked pasta, milk, salt, mustard powder and nutmeg and bring to a simmer over medium heat. Make sure to stir frequently and stay near the stove during this step – milk goes from simmer to boil very quickly and can overflow if not watched! Once the mixture is simmering, turn the heat to low and cook for 15 minutes, stirring frequently, until milk is absorbed and macaroni is fully cooked. Add grated cheese and stir into pasta. Turn off burner heat and cover saucepan. Let sit for about 5 minutes. Heat a dry skillet over medium heat and add bread crumbs. Toast bread crumbs, stirring occasionally for a few minutes until browned. 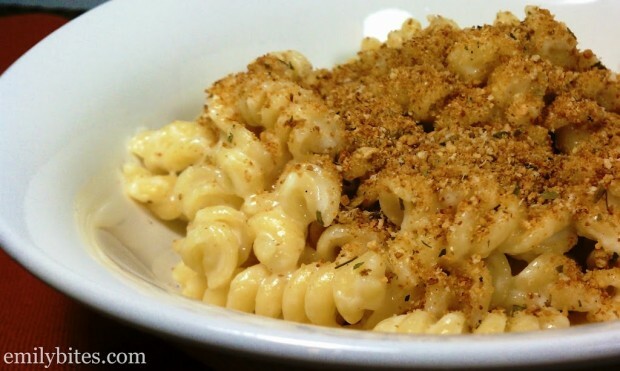 Split macaroni & cheese into 4 bowls and sprinkle two teaspoons of toasted bread crumbs onto each serving. Enjoy! I don’t think I could eat 1 serving at a time. I’d like to eat it all at once! I’ll have to make this for the family. Thanks for sharing! It’s pretty yummy. I actually made this tonight for my family before I even saw this post. It does take a bit of time to make, but it truly is creamy! Can you use light cheese to cut the fat? I don’t see why not, but if you do that I recommend using 2% cheeses over fat free. Fat free cheese just doesn’t taste right. I usually use 2% cheeses in my recipes, but here where cheese is the star of the show I really wanted to get the best cheese flavor possible. It was worth it to me to have it be a little pointier. Any recipe that only leaves one pot to wash is a winner in my book :). Glad it was a hit! Hey Emily, could I adapt this recipe to the macaroni and cheese cups? I have a feeling that I would eat the entire pot full in one sitting if I weren’t careful! You could certainly try it! I would definitely add the egg & egg white from the other recipe to help it stay together. I haven’t actually made the mac & cheese muffins in a long time so I don’t remember how much more creamy/saucy this one is. Let me know how it works out! Could I use almond milk instead of skim milk? I’ve never had almond milk before so I have no idea what it’s like. You can certainly try it! I just used soy milk and it worked! So Yummy! Made this tonight! So good, and so easy! I think the hardest part was grating the cheese! Thanks for the recipe! fyi i have been using coconut milk no sugar as a sub and its worked fine. I just made this recipe! It was so good! I made this recipe for me and my boyfriend last night and it was SO easy! I used Cabot Sharp Cheddar which gave the mac and cheese a subtle flavor, and I think next time I might go for the cheese you used for a bolder flavor. Thank you for sharing this! I am so happy to have found your site through Pinterest! I’ve been struggling with Weight Watchers after a month of using it, and you have so many yummy Weight Watcher friendly recipes! I’m adding this to my list. Thank you! I know this is an older recipe, but I wanted to share that I couldn’t find that particular brand of cheese in my grocery store so I used Cabot Extra Sharp New York Cheddar and it turned out great! This recipe is delicious and so easy.